This code was posted a few days back but I missed it. Sooo, here it is. 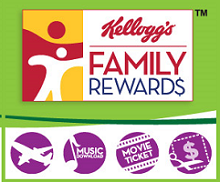 Get 150 FREE Kelloggs Family Rewards Points when you enter the following codes. You can redeem your rewards to get Coupons, Discounts, Gift Cards, Sweepstakes & Instant Wins, Books, Music, Magazines, Electronics, Toys & Games, Housewares/Kitchen and Apparel & Gear.